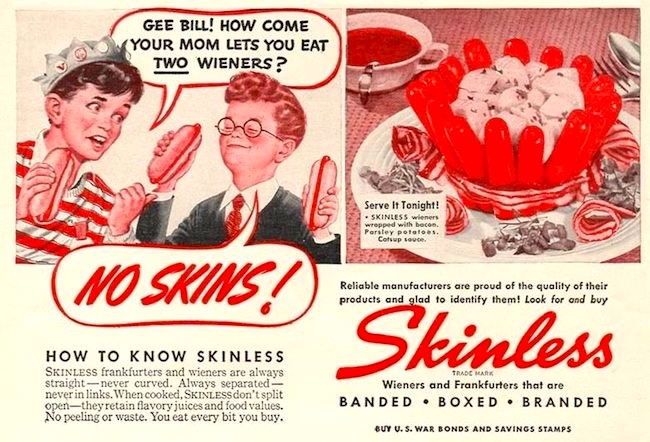 Skinless wiener is pretty much immediately risible, because it’s bound to bring circumcision to mind. 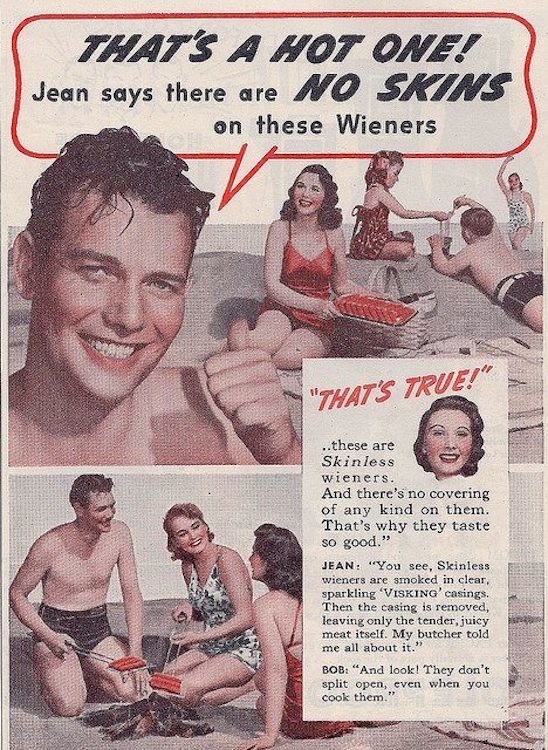 According to these Visking Corp ads from the 1940s, not only are skinless wieners tastier, but they’re also more tender and juicy. We’re not sure, but could they be making a commentary on circumcision while also trying to sell hot dogs? While we’re perfectly willing to accept that we may just have our mind in the gutter, we still wanted to share these vintage ads. If for no other reason than the fact that they’re absolutely bizarre. Viskase (formerly Visking) is a global corporation based out of Lombard, Illinois, United States that supplies plastic, cellulose, and fibrous film and packaging to the food service industry, including casings for processed meats such as hot dogs and sausages. Viskase has manufacturing facilities in the United States, Mexico, Brazil and France, as well as sales offices located around the world. Edwin O. Freund, founder of what would become Viskase, sought a readily available replacement for animal intestine casing. Upon creating a cellulose casing, using the “viscose” process (also used in rayon) he realized the product stuffed well, linked, and was able to withstand the smokehouse. Quite by accident, he discovered that when the casing was removed from the product the sausages retained their shape and were firm. This was the beginning of the skinless frankfurter or hot dog. 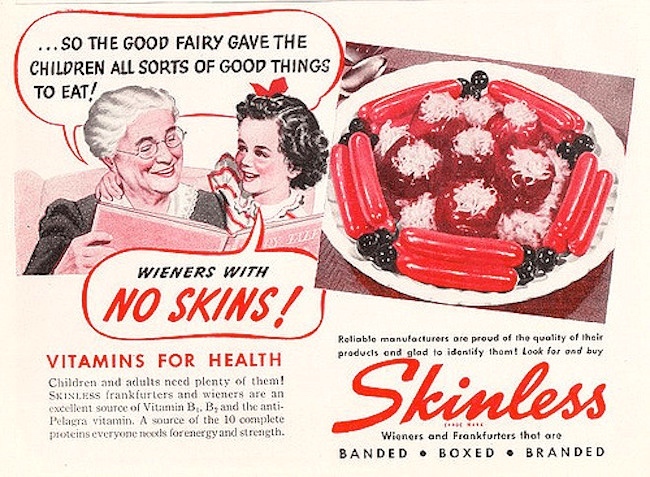 I don’t know whether the ads were created in-house or (more likely) farmed out to an ad agency, but in any case the creators seem to have been unaware of the possible dangers of wiener in skinless wieners and eat wieners, not to mention fairy. I was a kid in the 40s, and I can attest that all of these usages could raise a laugh back then. This entry was posted on August 17, 2017 at 7:40 am and is filed under Language and food, Language and the body, Language in advertising, Names. You can follow any responses to this entry through the RSS 2.0 feed. You can leave a response, or trackback from your own site.